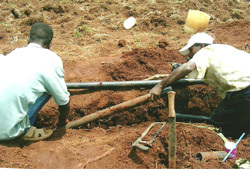 Waterlines works in small communities, usually with populations between 200 and 1,000 people, where water sources are contaminated or distant. For a complete list of communities that Waterlines has been involved with in specific countries, please enquire via email by clicking here. Waterlines works primarily with gravity-flow water systems, rainwater-catchment tanks, and spring protection improvements. In some school projects, Waterlines also sponsors the construction of latrines and establishes a complete educational program called “WASH” (WAter, Sanitation, and Hygiene). Click on the following links for detailed accounts of Waterlines' projects in Ethiopia, Kenya, Mexico, and Panama. 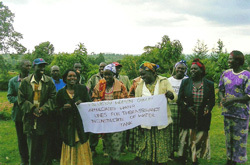 A typical rainwater-catchment tank for a primary school in Kenya costs $3,000. 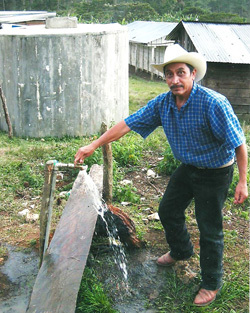 A typical gravity-flow system bringing spring water down to a rural Panamanian village costs $8,000 for the spring box, several kilometers of tubing, a holding tank, distribution lines, and faucets. Each community contributes labor, materials, and funding, equivalent to 25% of the total cost to build the system. Please note that Waterlines has a backlog of projects waiting to be funded. No project requests are accepted online.